The Boston Bruins made their first series of cuts on Sunday and there weren’t many, if even any, surprises. All of the team’s major junior-required players were sent back to their respective leagues: Jakub Zboril (QMJHL), Zach Senyshyn (OHL), Jeremy Lauzon (QMJHL) and Jesse Gabrielle (WHL) all made strides from their first NHL camp a year ago, but because of the CHL (Canadian Hockey League- the umbrella organization of all three major junior leagues) agreement with the NHL to return all players who don’t turn 20 by December 31 of the season back to their junior teams if they don’t make the big roster, it was wishful thinking in the extreme for anyone to believe that any one of those players had a real shot at breaking camp in Boston. They’re good prospects, all four- but they aren’t ready to seriously compete for NHL jobs. You have to balance the optimism and desire to roll out the shiny new toys with the reality of the current roster makeup and understand that for every major junior kid you try to shoehorn into the lineup, someone else will likely have to be exposed to waivers to keep them on the NHL roster. When you consider the fact that not one of them showed a readiness to be top-end contributors out of the hopper, what is the point of even entertaining keeping them around? Better to return them to junior and let them dominate if that’s their mission. Whether we agree that the inability to put them in the AHL is an issue or not, it’s a moot point, because that’s the system we have, not the one we wish we had. 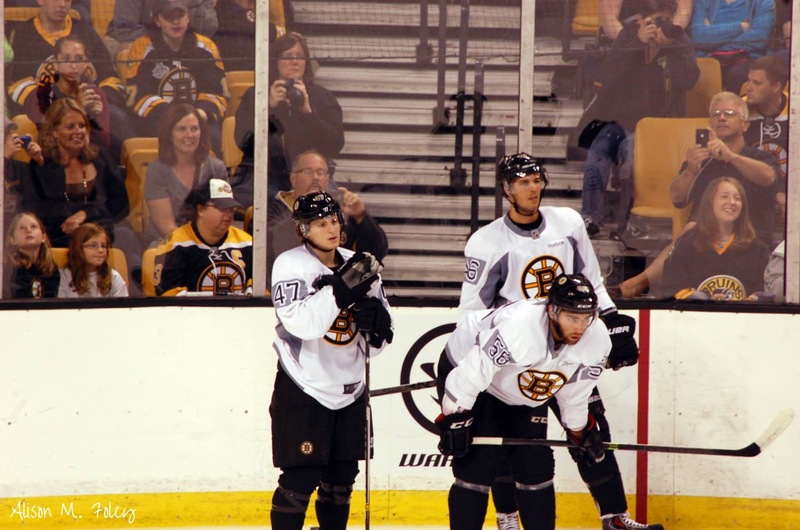 All of Zboril, Senyshyn, Lauzon and Gabrielle show impressive promise and at some point, their time will come to take their place on the Boston roster…or not. But that time is not now, and the B’s needed to put the emphasis where it belongs: on those who are realistic options to make the team and contribute to the 2016-17 pro hockey campaign. A raft of players were sent down to Providence, whose AHL training camp opens this week. Peter Mueller, who was in Boston on a professional tryout (PTO) before being released on Sunday will give it a go with Providence in hopes of landing an AHL contract and possibly more. The eighth overall pick in 2006 is 28 and could help the B’s farm team, but any hopes of his being able to make an impact at the NHL level after concussions essentially halted his progression. He’s spent the last three seasons in Europe trying to work his back to the top rung of the hockey ladder, but the Cinderella comeback just wasn’t happening based on early returns with the B’s. Forwards Anton Blidh, Colby Cave, Peter Cehlarik, Colton Hargrove and Justin Hickman were returned to Providence, along with defenders Linus Arnesson and Matt Grzelcyk plus goaltenders Zane McIntyre and Dan Vladar. Veteran minor league defensemen Chris Casto, Tommy Cross and Alex Grant (all under contract to the Bruins) were placed on waivers and cleared for assignment to Providence. Players on AHL deals: Mark Naclerio, AJ White (forwards); Josh Atkinson, Chris Breen, Alex Roach (defensemen) and goaltender Matt Ginn will attend the P-Bruins camp this week. Truth in lending here: we keep seeing raves about Blidh’s play and the Scouting Post (TSP) simply can’t get excited about this guy. He’s an agitating, energetic player but we just don’t see the skill/smarts needed to offset his average size at the highest level. Blidh’s moxie is appealing, but he looks like another solid AHL guy but not someone who is going to do much more than contribute in limited fashion if he ever makes the NHL. Unlike Vladimir Sobotka, who actually has some hands and creativity to go with his physical, agitating style, Blidh is an undersized mucker who isn’t going to do much offensively. Those types are a dime-a-dozen, so again- why get excited about a player like this? If he makes it, great- but we wouldn’t bet the farm on it. TSP is higher on Cehlarik- he does have the size and offensive game to eventually work his way into the NHL mix. His skating has gotten better than when he was first drafted and there’s some upside here, he just needs more time to adjust to the North American pro game and it made little sense to do discovery learning in Boston when he can see a bigger role in Providence. Grzelcyk showed some impressive flashes that we’ve long known him capable of bringing as an offense-minded defender and power play guy, but like Torey Krug four years ago- he needs to be in Providence where he can play a lot and develop properly under Kevin Dean, the Providence 1st-year head coach after being Butch Cassidy’s assistant for several seasons. Hargrove and Hickman are both big, rugged power forward bookends who don’t bring much sizzle or flash, but play that heavy, grinding style with the ability to put pucks in the net. Neither is ready for primetime, but watch for both to have expanded roles in Providence this season and work their way towards seeing time in Boston, much like Tyler Randell had to do. We’ve said it before, but Arnesson is not the droid we’re looking for. He’s a good guy with a solid skating and defensive mindset, but he’s not progressed much from when the B’s took him at the end of round 2 in 2013, and he’s just another guy at this point in a system that has more than enough of those. Talent-wise, he could play on the B’s right now, but he’s not going to make much of an impact. The clock is ticking, but other than being a pedestrian, bottom-pair kind of defensive D-man, it’s hard to project Arnesson as much of an impact player in Boston. McIntyre showed promising signs of rebounding from a tough finish to the 2016 season. He’s got work to do in refining his technique, but we’re confident he’ll take strides forward this season in the AHL. The AHL cuts mean that both of Brandon Carlo and Jake DeBrusk are still on the Boston roster, along with fellow rookie pros Danton Heinen, Rob O’Gara and Sean Kuraly. Put these players in the dark horse category for earning NHL spots out of the gate, but it’s not outside the realm of possibility that one or two could make the cut. Heinen seems to be the most mature/refined of the bunch and the B’s took a hit at wing when Frank Vatrano was lost for three months after foot surgery last week. By virtue of being late-’96 born players, both of Carlo and DeBrusk can play in Providence this season. DeBrusk is a personal favorite- he can score in a variety of ways and is a good kid. I don’t think he makes the final cut in Boston, but wouldn’t completely count him out, either. He scored the decisive goal against Philadelphia via shootout on a wicked laser beam, and he’s done what the B’s have asked of him since being the 14th overall pick in 2015. Now- admittedly, guys like Kyle Connor and Colin White are players you can make an obvious case for over DeBrusk at that spot, but that’s spilled milk at this point- the former Swift Current and Red Deer (WHL) standout has shown himself to have first-round talent and it will be interesting to see how he adjusts as a rookie pro. If he can make a rapid adjustment, 20-25 goals in the AHL is not an unreasonable projection. Carlo is another guy who could possibly earn an NHL roster spot right away, and if he does that, more power to him. Even if he plays a reduced role from what he would in Providence, Carlo has the size, mobility and drive to make an impact this year. By virtue of being in Boston and practicing with the team he’ll develop, but it is up to the coaches and management to decide what scenario is most beneficial for him. Everybody likes Danton…and that makes sense. Heinen is a versatile, mature and polished winger who signed with Boston after two years at Denver University (friendly reminder that you heard that here first, folks). TSP has said this repeatedly- he’s not someone who will dazzle you with his skill and ability- you have to be a student of the game to appreciate what Heinen brings in spades. The board work, the subtle passing touch and right spaces he moves the puck to under pressure, the ability to get in position for a quick shot or deflection to find the back of the net. He’s been everything as advertised, and yet we still see folks taking that “entertain me” approach with him and questioning what all the hype was about- well, if you buy into the hype, that’s your problem. Much of what I have seen from Heinen is right on par with what he did in the NCAA after the B’s took him in the fourth round two years ago. He’s making this team, folks- that’s the story and we’re sticking to it. O’Gara and Kuraly are longer shots. Both have played well, but by virtue of being able to go down to Providence without being exposed to waivers, they’ll likely begin the season on the farm. O’Gara is the sure, steady, shutdown guy we’ve come to take for granted. If O’Gara somehow sticks in Boston, it won’t be that much of a surprise, but given the current makeup of the defense, he’d really have to knock at least one if not more veterans out of the mix- that’s a tall order for a rookie. Kuraly is impressing with his size and skating, but I still don’t see a great deal in the way of puck skills or hockey sense to be a top-six NHL forward. He probably tops out as a lower-end third line guy at the top level, but could be an effective fourth-liner. Pro prospects Noel Acciari, Austin Czarnik and Seth Griffith are still in the mix as well, and offseason free agent Tim Schaller has battled injuries, but will be given an opportunity to make the final Boston roster. All, save for Czarnik, have NHL experience. Looks like Acciari dodged a bullet/leg injury in the preseason and is back in action- the B’s are trying him on the wing after he played fourth-line center in the final 19 games of 2015-16. He’s a heavy-on-the-puck hitter ideally suited for a grinding role, and I have to think Claude Julien is looking for excuses to keep him on the NHL roster after what he showed last spring. Czarnik is a little engine that could-type guy- small, but tremendously fast and skilled. He’s making noise in camp after being a top performer in Providence as a rookie last season. He’s a little buzzsaw of offensive playmaking ability (with an underappreciated goal scorer’s knack) and the smarts to be a capable three-zone player in time. The B’s would have to make room for him this season, but Czarnik is earning it the old fashioned way- by working hard in offseason and practice and then going out and performing. Lack of size is the only knock on the former Miami University captain. Griffith is still hanging around, and good on him. TSP’s position on him is that he’s headed into dreaded ‘tweener territory- an effective AHL scorer who lacks that extra something that translates to the NHL level. Without size and speed, he’s hard-pressed to excel in a bottom-six checking role in Boston. Schaller, who was signed as an unrestricted free agent on 1 July, was a top defensive forward for Providence College before turning pro with the Buffalo Sabres. He’s split his career between the AHL and NHL, but given that he would have to be exposed to waivers to be sent down, watch for him to be given every opportunity to make the Bruins roster. This gives him an inside edge on Kuraly, who can be optioned down to Providence without being subject to waivers. Finally- the B’s also brought in veteran defenseman Christian Ehrhoff on a PTO. He’s no longer the player he was for Vancouver in 2010-11 when he was one of the most sought-after free agents, and to be completely honest- isn’t likely to return to his zenith as a top-2 NHL defender- so even if Don Sweeney were to sign him, he represents a marginal upgrade at best. The problem isn’t Boston’s back-four- it’s the top-two/three. Ehrhoff is more fool’s gold- he’s a name guy from five years ago who simply hasn’t performed to the level of expectations after elevating himself over a two-season period with a top Canucks team. He’s probably better than Joe Morrow, who has shown he has the tools but might lack the toolbox to be an effective NHL defender (and we were big on Morrow’s potential coming out of the 2011 draft and after the B’s acquired him two years later), but saying that is more akin to putting lipstick on a pig at this point. At 34, he’s not getting any younger, but with almost 800 NHL games under his belt he’s got experience and can play both the left and right sides even though he’s a left shot. The Bruins are already being projected to miss the playoffs for a third straight season. Barring any significant change to the top of the defense, that’s not a prediction to taking major umbrage to, but the team is showing signs of developing talent to contribute down the road. That isn’t going to help the 2016-17 B’s roster all that much, but with a savvy move or two, not to mention key NCAA prospects like Charlie McAvoy, Jakob Forsbacka-Karlsson and possibly even Anders Bjork on the horizon- there is reason for optimism. The Bruins got some good production this week from prospects at all levels. Zach Senyshyn picked up a hot stick after the scoring well had run dry for him the previous few weeks, while Frankie Vatrano continued his scoring ways to push his AHL-leading total to 10 goals in the young season. At that rate, we will see him make his NHL debut sooner rather than later. Alex Khokhlachev also tallied a couple of markers in Friday’s ‘Pink the Rink’ game to stay atop the team in scoring. 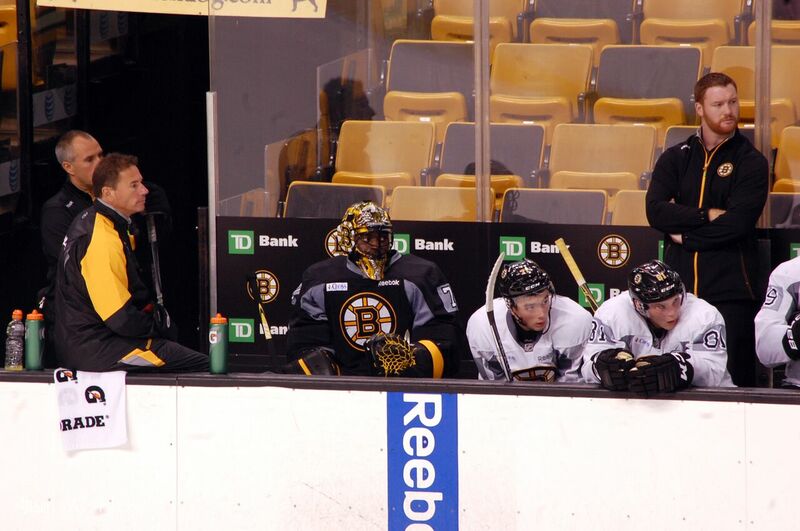 Malcolm Subban returned from lower body injury to post a 1-1 record, winning his first start. Zane McIntyre played well against the Hartford Wolf Pack on Halloween night, but fell in overtime on a goal by Brian Gibbons in a 2-1 contest. Jakub Zboril got two goals over the weekend, his first scores of the season after a tough start dogged with some criticism of his attitude. This will be something to watch going forward, but the talented Czech appears to be finding his offensive groove. Jeremy Lauzon cooled off a bit (if you call four assists in three games cooling off, that is) from his blistering start, but is still playing a ton of minutes for RN’s high-powered team. Jake DeBrusk keeps motoring along with a four-point week (1g, 3 a) to push his point total to 20 in 13 games. Jesse Gabrielle was held off the score sheet after being named WHL Player of the Week seven days ago. In college, Ryan Donato scored his first NCAA in a Harvard win over Dartmouth, as the Crimson went 2-0 to open the ECAC season. Danton Heinen had a brilliant 3-point (2 goals) night against Boston College on Friday, but lost the war, as a late third period goal sent DU down in defeat. Providence center Austin Czarnik is still out of the lineup since taking a hard hit in the fourth game of the season. Senyshyn scored three goals in three games last week. Zboril got off the scoring schneid- his first of the season came in a loss to Rouyn-Noranda (Lauzon tallied an assist in his club’s win), a low bullet-fast wrist shot from out near the point. One NHL scout from a Western Conference team at the BU-Merrimack game on Friday texted me to say that JFK was “the best player on the ice”, passing on that the Bruins scouts really might have outdone themselves with the picks the team got from Calgary- Zach Senyshyn, JFK and Jeremy Lauzon. Heinen scored a pair of impressive goals against BC before his team dropped a Saturday contest to BU. After going without a goal in the 2014-15 season (24 assists) in 36 games, Benning has already tallied once and should be one of the Huskies’ top players as a junior. Brutal offensive start for the Redhawks captain, who was acquired last June for Martin Jones. Far more was expected of the senior and 2011 Sharks pick, but there is time for him to get his season on track, but for someone who was expected to build on his 19 goals from a year ago, that’s going to be a tough proposition. The Boston Bruins announced that forwards Austin Czarnik and Frank Vatrano, along with defensemen Linus Arnesson and Chris Casto, were sent to Providence on Tuesday. Interestingly, the B’s brought some previously relegated players in fowards Brandon DeFazio and Ben Sexton, along with minor league defenseman Chris Breen. This puts the current count of forwards on the roster at 20, defensemen at 11 and the B’s are carrying three goaltenders. Dennis Seidenberg is injured and won’t be available for about the first eight weeks of the season, so the D count is really at 10 right now, with Breen and Tommy Cross expected to go back down to Providence if the team opts to go with eight defensemen out of the chute (including the banged up Zdeno Chara). The moves are not all that surprising- Czarnik, Vatrano and Arnesson all show intriguing promise, but they are all entering their first full pro season after all seeing limited action in the AHL last spring. I know that fans love their shiny new toys, but these guys need to be playing, and they weren’t going to be getting a lot of playing time in the NHL, even if they made the roster. And by the way- to keep a young forward on the big club means that the B’s would in most cases have to place another veteran on waivers. No big loss in Max Talbot you say? Well, he most likely would not be claimed, but the B’s value his experience and leadership more than a lot of the folks watching the games, so let’s just say that paying him nearly a million dollars to play in the AHL is not the best use of team resources, regardless of how he has looked in some limited preseason action. As for the recalls, they’ll get a chance to play in the final couple of preseason contests and likely go back down. The guys pushing for spots at forward need a strong push here at the end to make their case: Alex ‘Koko’ Khokhlachev has shown that he’s got some legitimate skills, but we’re still waiting on the production to take shape. Even when Ryan Spooner was trying to make the B’s in his previous two exhibition seasons, he was scoring goals and points in the preseason. Koko has done some good things, but the pucks haven’t been going in for him. At this rate, he’ll be one of the final cuts, but will go down to begin the year in Providence. Tyler Randell is an interesting case. He’s a late-round pick from 2009 who never really stuck around in preseason much for fans to get a handle on, but has done the grunt work down in Providence as an enforcer. He’s a player with a good set of hands- he once scored 4 goals for the Kitchener Rangers during a 2012 OHL playoff game against the Plymouth Whalers (who featured Washington power forward Tom Wilson). Randell’s not much of a skater, but the guy can fight and he could find a spot for himself with his toughness. He wouldn’t be an every game player, but could slot in when the B’s needed to add some bite to their roster. I keep seeing Randell linked to Shawn Thornton as a comparable player and I won’t go there other than to say that they are two different players and fans have to understand that Thornton came to the B’s as an established NHL veteran who was added as much for his character as he was for the toughness he displayed. Randell’s not there yet, so temper the expectations- he’s still growing and learning as a player. I’ve been impressed with Anton Blidh– he’s fast, gritty and energetic. He’s always moving his feet and qualifies as a grinding agitator type. It might be a situation where the B’s feel like he’s better served getting more minutes in Providence initially and then bringing him up when the inevitable injury happens up front, or he could very well make the Boston roster to start the season. These last couple of games will be critical for him, but because he can go down and not be subject to the waivers process, the team at least has options with Blidh. He’s on the bubble and close, but I predict he’ll start the year in Providence. Ditto Brian Ferlin, who has played well in preseason, but will find himself the odd man out on the right side with a chance to go back to the AHL and play top-two line minutes and in all situations. Finally, I’m sold on Joonas Kemppainen to start the year as Boston’s fourth-line center. He’s mature, smart and does the little things for the position. I like his faceoff work and he does a nice job of making the right reads coming out of the zone and moving the puck to the open spaces on the ice. He’s not going to wow you in any one area, but I can see why the Bruins signed him out of Finland at age 27. The final roster picture is coming into focus, but after the sluggish night against Detroit in the 3-1 loss Monday, that’s a harbinger of more nights to come. Loui Eriksson’s goal was too little, too late and the offense will have to overachieve to score regularly this season by the looks of it. Would like to be proven wrong, but even in Boston’s victories, the cup of offense has not runneth over.